Located Wollongong is a seaside city, 82 km south of Sydney. We have proudly given our time, talents and energy to the community since our charter date, raising funds, providing scholarships, and supporting projects assisting women. Fundraising for our annual scholarship for a woman attending the University of Wollongong. Young woman in public affairs award function. 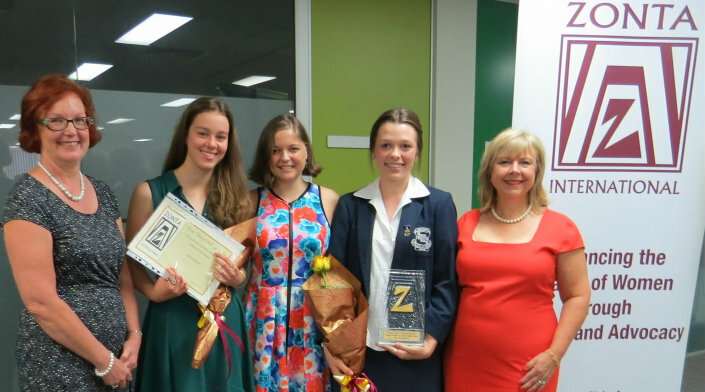 This community participation award is available to years 11 and 12 girls from participating schools. The winner is entered in the District 24 Zonta International Young Women in Public Affairs award. We have established a Z Club for students at St. Mary’s Star of the Sea College. Fundraising for two annual needs and merit based scholarships for women attending TAFE. A Birthing Kit Assembly Day is held every year. We celebrate International Women’s day with a community function. We offer an annual award to an Indigenous female student in year 10. We participate in White Ribbon Day events. We hold events as part of the Say No to Violence Campaign, such as cinema advertising, library displays and we involve students from the Z Club. • Fundraisers include high teas, fashion parades, dinners with guest speakers, sausage sizzles, award lunches, fellowship activities. • Guest speakers are included in the program at most monthly meetings. added to the club’s event and meeting invitation lists. If you would like to support ZONTA projects but are restricted by time, why not make a donation and contribute to Zonta’s efforts to improve the lives of women and girls.